› Author Affiliations Funding None. Microduplication of 22q11.2 involves having an extra copy at position q11.2 on chromosome 22. Very few cases have been reported but the real incidence may be higher as the absence of obvious clinical signs makes diagnosis difficult. In the cases that are diagnosed, the phenotype is extremely variable. We describe a case of severe micrognathia, cleft palate, and Pierre-Robin sequence. 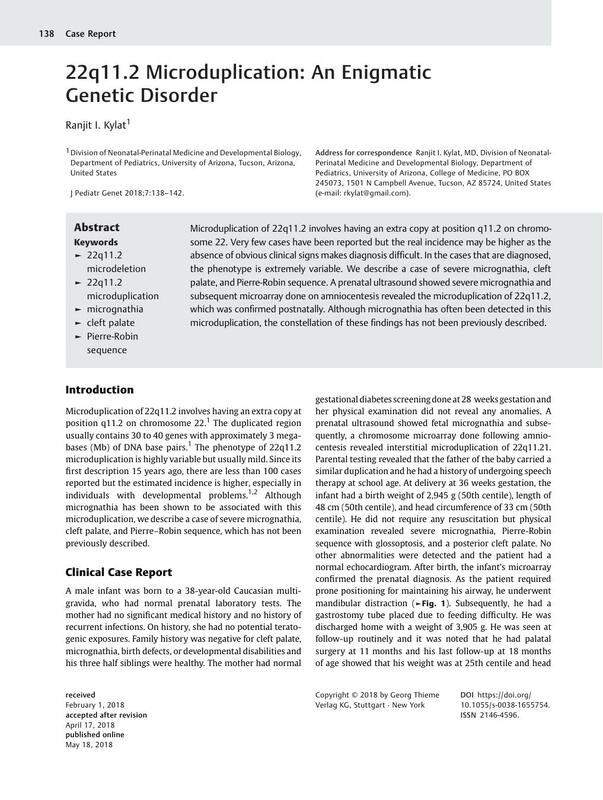 A prenatal ultrasound showed severe micrognathia and subsequent microarray done on amniocentesis revealed the microduplication of 22q11.2, which was confirmed postnatally. Although micrognathia has often been detected in this microduplication, the constellation of these findings has not been previously described. Full consent was obtained from the patient's parents for the case report. Research and ethics board approval has been obtained. 1 Firth' HV. 22q11.2 Duplication. 2009 Feb 17 [updated 2013 Nov 21]. In: Adam MP, Ardinger HH, Pagon RA, Wallace SE, Bean LJH, Mefford HC, Stephens K, Amemiya A, Ledbetter N. , editors. GeneReviews® [Internet]. Seattle (WA): University of Washington, Seattle; 1993-2017 . Available at: http://www.ncbi.nlm.nih.gov/books/NBK3823/ PubMed PMID: 20301749. Accessed January 2, 2018.